The Rings of Saturn are not, of course, composed entirely of lost airline luggage. In this small gallery within an ornate Victorian arcade, there’s not a suitcase in sight. The proposition isn’t entirely tangential, however, as the work of Mick Peter, Maurice Doherty, Owen Piper and David Sherry—all graduates of Glasgow School of Art who’ve exhibited regularly both nationally and internationally—is linked by ‘humour, irreverence and a sense of the absurd’. Before the ascent to the main course of the exhibition on the first floor of Stirling’s councilrun Changing Room gallery, the visitor encounters Owen Piper’s ‘Hanging Lights’, an installation displayed in the gallery’s window space. This work perhaps relates most directly to the exhibition’s title. Via the heat of a light bulb, slow holes are scorched into the cling-film skin which covers a dangling, suspended satellite dish. 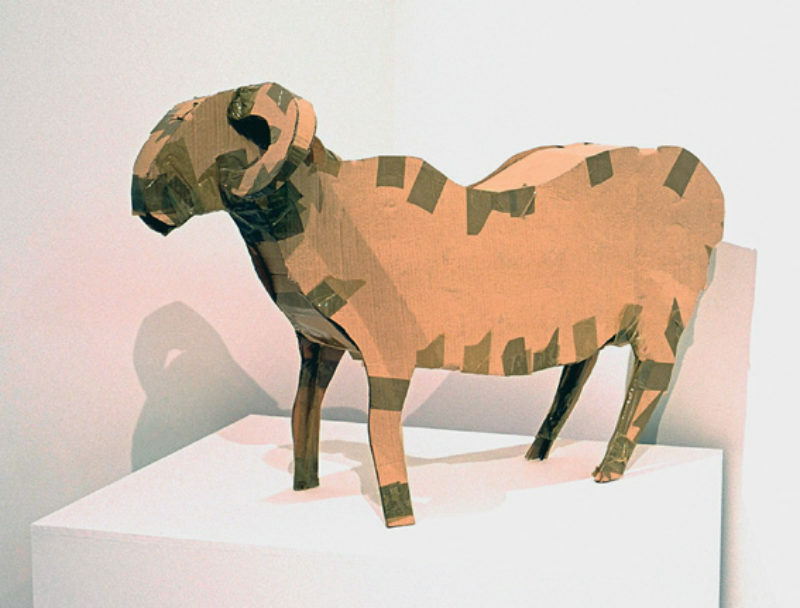 While Piper’s work invites reflection, the promised ‘humour and irreverence’ is more in evidence at the top of the stairs in Sherry’s ‘Sheep Clearing Throat’, a tragi-comic incarnation of the Fast Show’s Bob Fleming, rendered in cardboard and parcel tape with an amusing but unnerving soundtrack emanating from the belly of the beast. Competing for attention is Sherry’s nearby video ‘I am an astronaut’, a deadpan monologue delivered by a saturnine talking head. In it, the astronaut’s tales of interplanetary travel smack of magic realism in the coming together of incongruous banality, confessional and adventurous traveller’s log. Like the sheep, this work evokes an embarrasing speck of pathos, infecting any spontaneous laughter with a sour, guilty aftertaste. Peter’s ‘Buckets and Blankets (Trappist Version)’, is austere even in Trappist terms, appearing as a shoddily daubed cardboard bench, punctuated by buckets in the same material, with no further clue as to its function, symbolic or otherwise. ‘Cassette’ is, unsurprisingly, a scaled-up, tatty tape complete with the ubiquitous ‘winding pen’, for tightening up loose or twisted lengths, a process familiar to all mixtape aficionados pre-CD burners, and therefore nostalgic and affectionate in its references, if unwieldy in size. Peter’s further two works, executed in brush and ink, are oblique in their sources and referents, but rather than closing the shutters to the viewer, the fantastical scenes portrayed become more because of their baffling nature. In short, there’s something going on. I don’t know what it is, but I know what I like … and what I like here are, in ‘Sucking Mussels’, grotesque visions of railway architecture, a mishmash of Otto Wagner urbanity and bizarre Gothick fantasy, complete with verbose quotes from an unknown source. Whether capricious or designed, both this and ‘Mama, I got burned’, on the opposite wall, are funny in a Big Night Out kind of way—a marriage of the avant-garde and kitsch. At the back of the first room, Piper’s ‘Double Door’ divides the usually open-plan (or at least open door) gallery into two separate spaces by means of swinging saloon doors. The centre of the doors is pierced by a cut-out star shape, which serves to frame the fixed, smiling face of the endlessly hula-hooping woman in ‘Loop’, Maurice Doherty’s double-sided video projection in the room beyond. The doors, unmistakably celluloidinspired, are such that the temptation to burst, rather than walk through, is hard to resist, and gallery etiquette is put at risk by the potential actions of wannabe cowboys. This feast of Saturnalia may not be as licentious as its Roman precedent, but it’s similarly impious, peppered with visual raillery and, like W G Sebald’s book which shares its title, the Rings of Saturn might well be a meditation on the possibly restorative powers of art.